Some games ask you to shoot, jump or strategize in ways that are similar to what you've done. Sure, there may be unique tweaks designed to pique your interest but you mostly go in knowing what to expect. Other games are different deep down in their DNA, challenging the way you do even the simplest things. Miegakure's got four dimensions instead of three so, yeah, it's one of the deep-down-different ones. 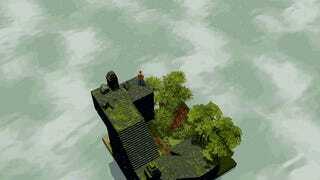 The long-brewing puzzle-platformer invites players into a fictional feudal Japanese landscape where they'll be able to slide into and around an additional plane of existence. The core concept's a bit of a head trip but seeing it in action makes it a bit more comprehensible. We got a chance to see what the latest build of Miegakure—which sports an all-new art style—plays like at PAX East and came away even more excited to play this game that might induce headaches.